Recently, my very dear friend Ruth Nemzoff pointed out to me that my recipes were pretty complicated, and had a lot of steps. Which seemed impractical given how busy I am and how many children I have. She is absolutely right of course. I realized that part of why I love cooking and experimenting in the kitchen is that I feel like I am doing something for my family but I don’t actually have to be with them. The kids can be running through the kitchen, and I can absolutely guiltlessly suggest that they play other places because I am. after all cooking for them. This recipe is actually not that time consuming if you use store bought gnocchi. 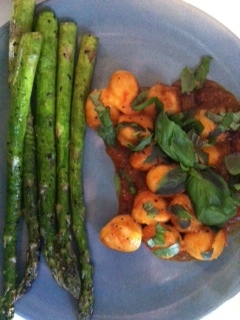 Gnocchi is kind of fun to make especially if complicated cooking projects are an escape of sorts which clearly they are for me. Start by baking the potatoes until they are soft to the touch. About an hour at 400 should do the job, slice them to cool and set them aside. Boil a large pot of water, about as much water as you would use to make any other kind of pasta (about 6 cups). Peel the potatoes while they are still warm, if they cool down too much they are harder to manipulate. I use the hand mixer to mash them after I have taken off the skins. Once they are mashed add the olive oil,salt and pepper and flour in ¼ cup intervals. I like to do this with my hands. When the mixture starts to get really doughy roll it out on a floured surface. Make 1 or 2 long snakes of dough and cut them every inch. The pieces should be bite sized, and will expand a bit when cooked. Lay out parchment paper, you will place the gnocchi on the parchment paper to cool after you have cooked it. Don’t let them touch or they will stick together. Throw your gnocchi into the boiling water, they are done when they float to the top. Gnocchi freezes well, so when I make it I make a few batches. Let them cool and then add whatever sauce you want. My son Pete loves pasta, and this sauce is his creation. I love the grilled vegetables of summer, we have even grilled peaches! I served this with asparagus that I just threw straight on the grill and drizzled olive oil and lemon pepper on after they had cooked. To make the sauce, just throw the tomatoes and the peppers straight on the grill. When they start to soften and blacken very slightly, pull them off. Throw them into a bowl with the olive oil, and crushed garlic, add a ¼ cup of water. You can add more as needed. Again I used the hand mixer to blend it all together, adding salt and pepper to taste at the end. Garnish with fresh basil. The sauce is rich but if you prefer it thinner add more water, this sauce also freezes very well. Next postYou don’t need incense and a cushion….